Wednesday's Republican spending bill is nothing more than a political stunt aimed at hindering Governor Evers’ ability to improve Wisconsin for all. MADISON - Yesterday the senate voted, along party lines, to pass the Republican’s irresponsible spending bill. This bill is nothing more than a political stunt aimed at hindering Governor Evers’ ability to improve Wisconsin for all, and it has led Republicans to vote for a bill that they know they cannot fund. The Republican spending plan will end up costing taxpayers more in the long-run, in order for Republicans to keep in place tax handouts to millionaires. I am disappointed to see their refusal to collaborate, and instead put their corporate donors first. The Republicans spending plan, paired with their Foxconn aspirations, would exceed the expected budget balance before the process even begins. 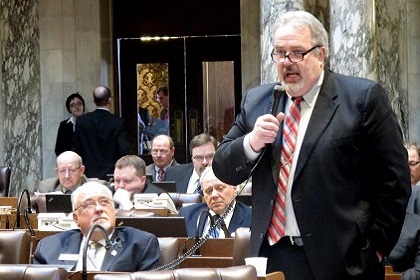 Governor Evers will be introducing his budget in a couple weeks, and the Republicans are attempting to tie his hands. The voters of the state sent a clear message in November that they want more investments in schools, health care and infrastructure, and by spending down Wisconsin’s general fund (GPR), the GOP would be hindering the Governor’s ability to deliver on those needs. Due to the lack of school aids under former Governor Walker, taxpayers in Wisconsin have resorted to raising their own property taxes in order to ensure our kids have the resources they need. Wisconsinites have voiced their concerns over growing health care costs, while Republicans continue to turn away Medicaid dollars and threaten health care protections, and our infrastructure is crumbling, forcing communities to resort back to dirt roads. GOP lawmakers have no problem squandering away taxpayer dollars, forcing hard-working Wisconsinites to make up the difference. Making substantial spending decisions prior to the budget being introduced is reckless and irresponsible. We will have months of discussions and decision making once Governor Evers introduces his proposal in a couple weeks, and Wisconsinites deserve a sustainable tax relief plan. We need to put money back in the pockets of the middle-class, while creating opportunities and growing our communities. It is possible to give the middle-class a tax cut, and make needed investments in our state. It is time that we stop playing politics, and reach across the aisle on real, smart solutions that work for all.